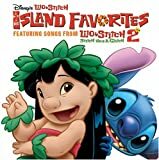 Pineapple Princess – Paroles de la chanson dans “Lilo & Stitch 2 : Hawaï, nous avons un problème !”. “Pineapple princess”, he calls me pineapple princess all day. As he plays his ukulele on the hill above the bay. “Pineapple princess, I love you, you’re the sweetest girl I’ve seen”. “Some day we’re gonna marry and you’ll be my pineapple queen”. I saw a boy on Oahu isle. He waved at me and he swam ashore. He sings his song from banana trees. We went skin-divin’ and beneath the blue. “Pineapple princess”, I love you, you’re the sweetest girl I’ve seen. We’ll settle down in a bamboo hut. Then we’ll be beachcombin’ royalty.